I recently became interested in water rocketry after realizing how complicated the physics actually can be, and the fact that the equations are best solved with numerical methods because so many interacting variables change rapidly in a non-linear fashion. 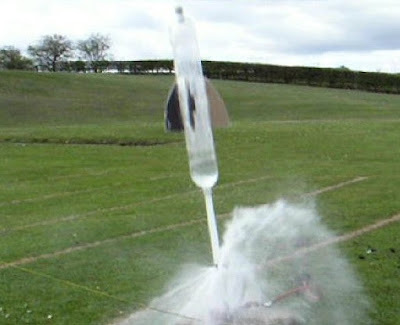 For those unfamiliar, a water rocket is a rocket that uses water as its reaction mass, powered by air pressure. The cool thing about it is the easy availability of pressure vessels — soda bottles. You get a free rocket body with each soft drink purchase! A typical soda bottle can withstand an internal pressure of 100 psi easily, and can go up to 160 psi before rupturing. Here's the basic bare-minimum set-up, without explaining how the launcher works. There are plenty of tutorials on building a launcher. Launching just a bottle without anything else attached. It sounds like a low-cost hobby, right? Wrong. Well, sort of. Cheap is possible if you just want to have fun and aren't concerned with performance. But if you want safety and reliability, building a launcher can set you back a fair amount: possibly up to $100 in parts, such as 50 feet of pressure hose, various compressor couplings and adapters, PVC pipe and fittings, safety googles, air pump if you don't have one already, and other parts. And if you're interested in competition, you need to spend at least that much more on a recording altimeter, onboard video camera, lithium-polymer batteries, chargers, and servo or mechanical mechanisms for parachute deployment. With a soda bottle rocket, the reaction mass "burnout" happens in less than 0.1 second, and the rest is a ballistic flight with altitude and duration time determined largely by the rocket's initial velocity and drag coefficient. It's very nearly a mortar except the initial impulse isn't an explosion, but spread out a bit in time (although still, less than 0.1 second). It might even be possible to model it as a mortar, if one could come up with a relationship between the mortar charge required and the water rocket's initial pressure, water mass, empty mass, and bottle volume. But to do that, you have to model the actual physics, and once you've done that, well, then you have a physics-based model and you no longer need a mortar approximation. Phases of a launch: (a) at rest on launch tube; (b) traversing launch tube; (c) and (d) water thrust underway; (e) air thrust (you can see the burst of vapor as the last water leaves); (f) ballistic flight after air pressure is exhausted. Traversing the launch tube. The launcher typically has a PVC pipe sticking up into the bottle, long enough to extend above the water surface to prevent the water from spilling back into the plumbing. You don't want to lose your reaction mass, after all. By happy coincidence, a 1/2" PVC pipe fits almost exactly into the neck of a soda bottle. There's just a tiny fraction of a millimeter gap, which is sealed off by an o-ring while the rocket sits on the launcher. 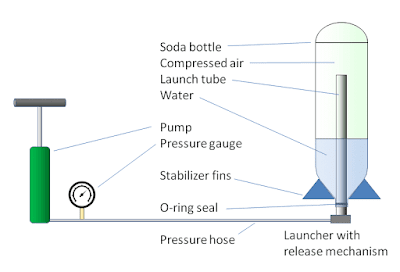 When the launcher clamp releases the rocket, the rocket travels up the launch tube by virtue of internal pressure alone with negligible loss of reaction mass, thereby gaining velocity before the water-thrust begins. This can add a significant (at least 10%) increase to apogee (maximum altitude) compared to having no launch tube. During launch tube traversal, the thrust is nearly constant, changing only slightly as the internal pressure decreases by the volume of the tube as it departs from the nozzle. So a closed-form non-numerical solution for velocity should work reasonably well. Water thrust. Here it gets complicated, with several interacting nonlinear variables. Thrust isn't constant because pressure is decreasing. And pressure doesn't decrease proportionally with water volume as one would expect — this is a rapid decompression that performs work, so the air experiences a drop in temperature, which in turn affects available pressure. The pressure changes non-linearly. And of course, acceleration isn't constant either. Acceleration actually increases (also non-linearly) because, even though pressure and thrust are decreasing, the rocket becomes rapidly lighter as it loses water mass. In addition, wind resistance grows with the square of velocity and becomes significant. Increased acceleration also causes the water in the rocket to be heavier, resulting in increased mass flow from the nozzle, which in turn affects thrust and mass. Plenty of stuff to account for, best solved by calculating all the changing variables at time increments so small that the changes are all approximately linear. Choked airflow. When the pressure inside the bottle exceeds the outside pressure by some threshold ratio, the airflow is choked at the speed of sound, which in turn depends on the temperature in the bottle. Unchoked airflow. Eventually the internal/external pressure ratio falls below the critical threshold and the remaining air exits normally, with pressure decreasing exponentially. Ballistic flight. The momentum gained from the thrust keeps the rocket moving. Wind resistance and gravity work against the upward momentum, slowing the rocket to zero vertical velocity at apogee, before it starts falling back down. Here, the rocket empty mass is important. Too little mass, and the wind resistance slams the rocket to a stop quickly. Too much empty mass slows down the rocket during thrust, reducing the final velocity available after burnout. An optimum amount of empty mass — not too much, not too little — will achieve the best combination of velocity and momentum to reach the maximum possible altitude. We need to use a small time increment (like 1 millisecond or less) to calculate each iteration of the thrust phases. For ballistic flight, the acceleration, velocity, and altitude change much more slowly than during thrust, so the time increment can be much greater, like 50 milliseconds. In fact, for ballistic flight it should be possible to find a closed-form solution that accounts for wind resistance without needing iterative steps, but it's just as easy to continue iterating at larger time steps. In the next installments, I'll go through the flight calculations in the order described above.